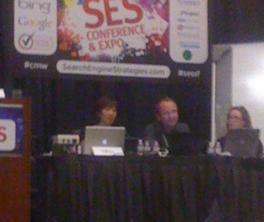 My third day at SES San Francisco wrapped up with a killer SEO lab. It was surprisingly not that popular with the other conference-goers, which allowed us to really pester the speakers with our questions and comments. So that was great. The moderator was Jonathan Allen, the director of SEW, and the speakers included Rand Fishkin (SEOmoz) who had to dip out early for another presentation, Jessica Bowman of SEMInHouse.com and Maile Ohye, Google’s Senior Developer Programs Engineer. The lab was populated with SEO-concerned webmasters and marketers from beginning to advanced skill sets. First, it started as a site review. All three of the speakers offered tips and suggestions for their submitted sites (with the owners in the audience able to shout out questions) and it was cool in a semi-basic sort of way. Once Rand left, things really picked up (by coincidence of course) and the quality of conversation had nothing to do with his departure, simply because Maile started to talk more about Google. Once the small audience realized she possessed some of the super-secretive-sauce that Google runs off of, it was then I felt bad for everyone else who chose to go to a different session! Not only did Maile insist that alt image text for image links was AS GOOD AS contextual anchor text for text links, she also confirmed that there were some problems within Webmaster Tools (crawl errors, which was highlighted on the Google Webmaster Central Blog), not the best for usability! It’s always nice to hear we aren’t the only ones with nagging to-do lists! Maile did talk about a lot of new features rolling out in Webmaster Tools and Analytics soon and hinted that Webmaster Tools will become better at URL parameters, suggestions, and of course, the new site notices. My guess is they will start to incorporate some of the Audit features of dev tools in your Webmaster Tools account too. I guess time will tell. It would be easier if there was a centralized location for uniformed data between Google’s resources and tool sets, but again, that may be wishful thinking. It seems Google is finally giving the same data we see in AdWords to organic search via Webmaster Tools. Alas, just in time to share with Google Places! The last site reviewed was a larger e-commerce site that had a huge drop-down menu in the nav area. By this point, Maile was not as forthcoming, and the other speakers suggested crafting navigation for users rather than crawlers. Who would want to bet that the answer would have been extremely different had a Google employee not been in the room? First thing on my list of things to do is to go through all my sites and make sure everyone linking to us in an image is using ideal alt image text! As with any Google confirmation, I won’t believe it until I see hard data showing it is so. Simply making sure your image links have proper text is something that should be done in the first place. Admittedly, I know there are some that I have let slide and can make a quick request and it is an easy fix. Brent is a consistent voice in the world of online real estate on the Web. He has been working on the cutting edge of SEO since 2001, and also worked extensively in the travel and hospitality SEO industries, and consistently produces results for the companies that he partners with. Brent can attribute his success to his diverse portfolio and a unique vision, which combines a background in technology with real world experience that lends itself to some very unique content and management. As technology and communication mediums continue to merge, Brent continues to research new ways to get a customer’s messages across to the readers and intended audiences. Follow him on Twitter, @BrentRangen. I sure did! It was a wonderful experience and one that will help me in my future endeavors. Bruce’s training was great too. Being in SEO quite a number of years, it surprised me that I learned a lot from the training session. For anyone who needs to learn SEO for their business, there would be nothing better than his training sessions. Very rarely do you see something so comprehensive in a easy-to-follow structure. Now I know why everyone talks to highly of the conferences. You could spend 10-15 hours per week keeping up with industry news and still not come close to what you learn in a three day conference like SES. Thanks for sharing your experience with us who are unable to attend. Looks like you’ve had a very fruitful time there.